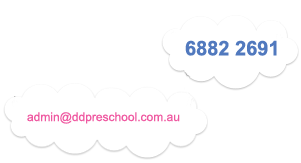 Preschool enrolments for the following year open on the first day of preschool (staff day as per NSW schools calendar) at the end of January from 8.30am. However enrolments may be made at any time during the year. An advertisement is placed in the middle of January to notify families of the enrolment date for the following year. Preference is given to enrolments made in person; however enrolment may still be made by phone (68822691). Children already enrolled will be offered enrolment for the following year. Your child's name will be placed on a waiting list and your contact details noted. You may be contacted by email after July each year inviting you to apply via an online enrolment process. All attempts are made to accommodate your needs; however the preschool cannot always offer your first choice of day or days due to the large numbers of children enrolling and limitations on how many children we can accommodate. The preschool is also required by our funding body to give preference to children meeting certain criteria. If your child is not offered a position in August/ September, they may be offered a place in 'second round' placements in October- December as we fill any remaining vacancies for the following year. Alternatively you may be offered a position at the start of the year or as a vacancy becomes available and we move down the waiting list. Please ensure your contact details remain current so we can contact you.